Why Do 4.37X7.5 Magnets Make Great Tradeshow Giveaways? Earlier there was huge demand for large magnets because marketers believed only such biggies would work for their brand. Today, they are outgrowing their misconceptions by printing over shaped magnets, custom die cut magnets and small sized rectangle and square magnets. 4.37 x 7.5 magnets are one such medium sized magnet, which is buying attention with it’s near to large shape. It is becoming a great tradeshow gifting item because marketers are slowly growing conscious about its benefits on their brand. That is absolutely true! Perhaps magnet advertising is all about creative explorations and experimentations. This means you can create any campaign without constraints. There is no one to stop you from selecting colors or printing your information the way you want. You can position your brand information and other contact details over these customized magnets as impressive as you can. For added benefits, you can convert these custom magnets into immediate leads by offering discount coupons, sales coupons, or mega bumper coupons. People would happily receive and retain a promotional magnet, which influences their brand consciousness and offers them big savings. Not only 7.5 x 4.37 magnets, in fact purchasing customized magnets from any reputed online store comes allow you to save on online design proof, art setup, shipping and full color printing. Remember not all eCommerce stores may offer you these valuable benefits, but you have to hunt for the ones, which sell only high quality made in USA magnets. You can easily avail attractive discounts on bulk ordering logo printed 4.37 x 7.5 magnets from any reputed online store stocking them. Cheaper does not mean inferior quality or weaker, rather it would mean that the supplier shares a great relationship with other suppliers in the niche. They are passing their advantage to their clients or customers by offering them attractive discounts. 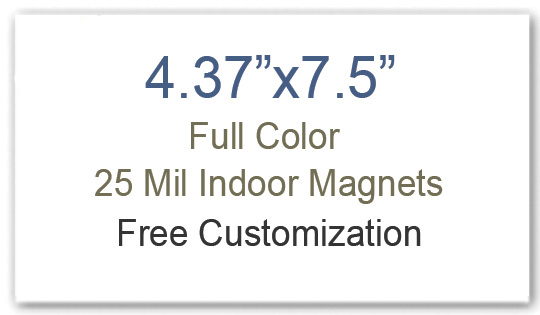 Advertising magnets 4.37 x 7.5 are usually sold at ecommerce stores stocking vast ranges of made in USA magnets, which means you are only receiving high quality lead free magnets. This makes them perfect for gifting during tradeshows, community programs, and other events, attended by people of all age groups. You can remain free with the contentment that you are only offering a purposeful and healthy promotional gift. As said before, 4.37 x 7.5 is not a large size, but it is not smaller either. It is a medium sized magnet, which means anything printed on it would easily buy attention. You can stay assured that people may not easily neglect them or throw them, whenever you present it to them. They would easily retain it as appreciation token and would advocate your brand to others. The above mentioned are only handful of the benefits of seeking values through 7.5 x 4.37 magnets, you can easily find many more by availing them for your next tradeshow.